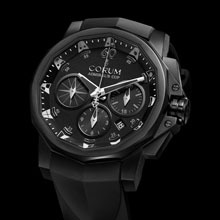 Mysterious, fascinating and currently very much in vogue, black is definitely one of CORUM’s favorite colors. With the Admiral’s Cup Black Challenge 44, the brand introduces a new interpretation that endows this model – in black or white dial versions – with a powerful, virile personality. Both variations feature the signature Admiral’s Cup twelve-sided case. Measuring 44 mm in diameter, it has been given an avant-garde black PVD surface treatment using cutting-edge procedures to achieve an exceptionally hard (1300 Vickers) coating. Also applied to the crown and the chronograph pushers, this treatment further enhances the intensity of the color, while reinforcing the sophisticated nature of the timepiece. Equipped with a date corrector at 10 o’clock and water resistant to 100 meters, the case is secured by a back engraved with the Admiral’s Cup trophy. It is fitted with a vulcanized rubber strap complete with folding clasp. Protected by a 12-sided sapphire crystal, the dial features the collection’s characteristic nautical pennants. Since the latter are usually depicted in full color, the monochrome pennants of the Admiral’s Cup Black Challenge 44 reinforce the strength of the deep shade of the black dial and the purity of the white dial. The hands are coated with a luminescent substance in harmony with the dial color. 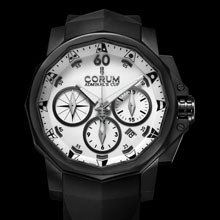 The Admiral’s Cup Black Challenge 44 houses Caliber CO753, a mechanical self-winding chronograph movement that is chronometer-certified by the COSC – a guarantee of precision and reliability. 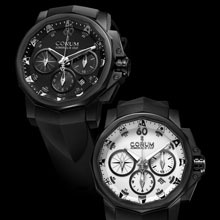 Powering chronograph functions as well as the date at 4.30 in addition to conventional hour, minute and seconds indications, this movement is graced with a rhodium-plated finish as well an oscillating weight engraved with the CORUM brand name.